Mrs. M. O. Eskew is visiting her daughter, Mrs. Pearl Abner of Kansas. Source: The Crittenden Press. (Marion, Ky.) 1919-Current, September 19, 1919, Image 3 - Chronicling America - The Library of Congress. Source: The Crittenden Press. (Marion, Ky.) 1919-Current, October 10, 1919, Image 3 - Chronicling America - The Library of Congress. 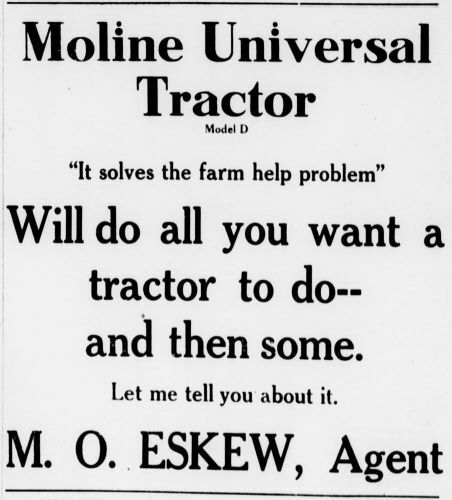 See M. O. Eskew for the Moline Universal tractor. Source: The Crittenden Press. (Marion, Ky.) 1919-Current, February 27, 1920, Image 5 - Chronicling America - The Library of Congress. Source: The Crittenden Press. (Marion, Ky.) 1919-Current, April 30, 1919, Image 9 - Chronicling America - The Library of Congress. We will rubber tire your buggy for $15 and guarantee the work. M. O. ESKEW. I still sell gasoline for 35C per gallon. M. O. ESKEW. 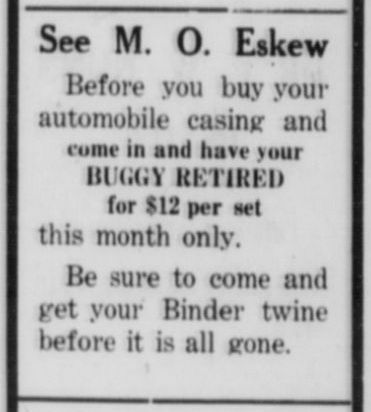 Go to M. O. Eskew for your telephone batteries. 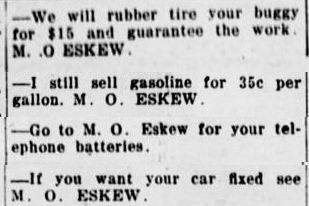 If you want your car fixed see M. O. ESKEW. Source: The Crittenden Press. (Marion, Ky.) 1919-Current, May 7, 1920, Image 7 - Chronicling America - The Library of Congress. We sell Goodrich tires and tubes. M. O. ESKEW. Source: The Crittenden Press. (Marion, Ky.) 1919-Current, May 7, 1920, Image 8 - Chronicling America - The Library of Congress. Source: The Crittenden Press. (Marion, Ky.) 1919-Current, August 20, 1920, Image 8 - Chronicling America - The Library of Congress. 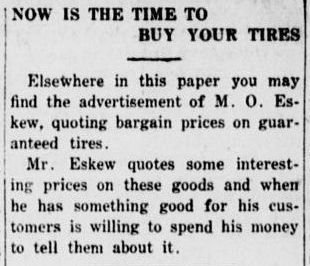 Elsewhere in this paper you may find the advertisement of M. O. Eskew, quoting bargain prices on guaranteed tires. 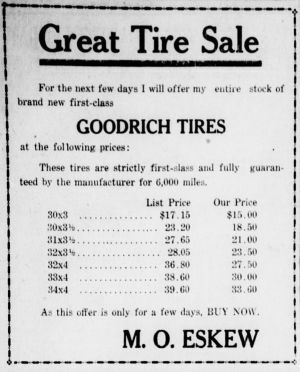 Mr. Eskew quotes some interesting prices on these goods and when he has something good for his customers is willing to spend his money to tell them about it. Source: The Crittenden Press. (Marion, Ky.) 1919-Current, August 27, 1920, Image 5 - Chronicling America - The Library of Congress. Mrs. James Carter, of Selden, Kansas, is visiting her sister, Mrs. M. O. Eskew, and other relatives and friends in this city and the country. Source: The Crittenden Press. (Marion, Ky.) 1919-Current, December 17, 1920, Image 5 - Chronicling America - The Library of Congress. Mrs. Andrew Eskew was taken to the hospital in Evansville for an operation Tuesday. Source: The Crittenden Press. (Marion, Ky.) 1919-Current, May 27, 1921, Image 5 - Chronicling America - The Library of Congress. Mrs. Harriett [sic] Eskew was sent to Louisville to undergo an operation. Source: The Crittenden Press. (Marion, Ky.) 1919-Current, June 3, 1921, Image 3 - Chronicling America - The Library of Congress. Mr. Andrew Eskew and little son Roy, visited S. D. Stembridge and family Sunday. 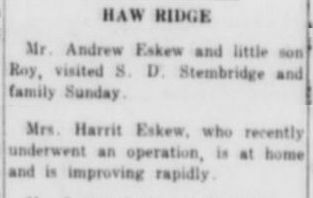 Mrs. Harrit [sic] Eskew, who recently underwent an operation, is at home and is improving rapidly. Source: The Crittenden Press. (Marion, Ky.) 1919-Current, June 17, 1921, Image 3 - Chronicling America - The Library of Congress. Mrs. Eskew has returned home after undergoing an operation and is getting along nicely. Source: The Crittenden Press. (Marion, Ky.) 1919-Current, June 17, 1921, Image 6 - Chronicling America - The Library of Congress. Two Good second cars for sale. M. O. ESKEW. We re-rubber your buggy while you wait. M. O. ESKEW. Source: The Crittenden Press. (Marion, Ky.) 1919-Current, June 3, 1921, Image 5 - Chronicling America - The Library of Congress. For the past few days the City Police Court has been extremely active in picking up breakers of the automobile light law. Seven people have already been fined and according to the City Attorney, four more warrants have been issued that have not yet been tried. Those who have been fined to date are: Andrew Eskew, Press Hill, A. Murphy, Crawford Clark, and Willis Glore, all of Marion. However Marion people are not the only ones subject to the wrath of the law, Zed Bennett of Paducah was fined Wednesday morning and Wm. Binkley of Crayne was one of the first to be picked up. All of the offenders to date have plead guilty and a uniform fine has been assessed on each, that of $5.00 and costs which brings the amount up to $8.00. Ellis Cline was fined $2.50 and costs on a charge of drunkeness [sic] Aug. 25. Wm. Franklin was fined the same amount on the same offense. Both plead guilty. Complaints by influential citizens are alleged to be the cause of the number of arrests of the motorists. Source: The Crittenden Press. (Marion, Ky.) 1919-Current, September 2, 1921, Image 1 - Chronicling America - The Library of Congress. 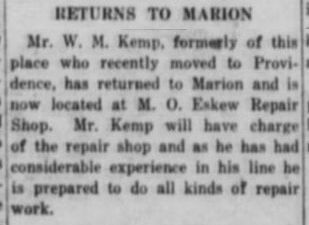 Mr. W. M. Kemp, formerly of this place who recently moved to Providence, has returned to Marion and is now located at M. O. Eskew Repair Shop. 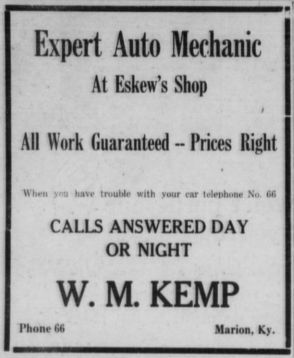 Mr. Kemp will have charge of the repair shop and as he has had considerable experience in his line he is prepared to do all kinds of repair work. Source: The Crittenden Press. (Marion, Ky.) 1919-Current, September 16, 1921, Image 1 - Chronicling America - The Library of Congress. Source: The Crittenden Press. (Marion, Ky.) 1919-Current, September 23, 1921, Image 5 - Chronicling America - The Library of Congress. Mrs. Vic Escew [sic] and son of Oklahoma City, are visiting her parents, Mr. and Mrs. Willie Joyce, at this place. Source: The Crittenden Press. (Marion, Ky.) 1919-Current, November 18, 1921, Image 3 - Chronicling America - The Library of Congress. Mr. J. W. Neal went to Providence Monday to visit his mother, Mrs. M. F. Talley. Mr. and Mrs. D. Stembridge and Mrs. H. Blanton went to Marion Sunday to visit Mr. A. Eskew and family. Source: The Crittenden Press. (Marion, Ky.) 1919-Current, April 14, 1922, Image 8 - Chronicling America - The Library of Congress. Source: The Crittenden Press. (Marion, Ky.) 1919-Current, May 19, 1922, Image 7 - Chronicling America - The Library of Congress. Miss Flossie Branham and Solie [Sally] Eskew spent Sunday with Miss Minnie and Mary Hillyard. Source: The Crittenden Press. (Marion, Ky.) 1919-Current, November 3, 1922, Image 5 - Chronicling America - The Library of Congress.